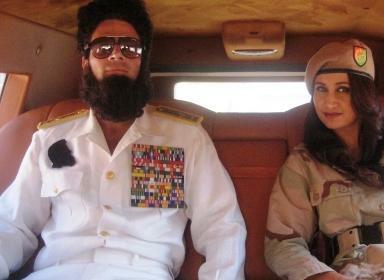 Dartz Prombron Aladeen “The Dictator” SUV for Sale! In the theme of ‘The Dictator’, Admiral General Aladeen is seen spoofing around his country of ‘Wadiya, with eccentric ways of carrying on his dictatorship. Taking a rather sarcastic dig at the Middle Eastern dictators, this flick was all about the eccentrics of what rulers from the region have been known to indulge in, but all in a comic representation. It turned out to be quiet the crowd puller, and like most hit movies, the memorabilia collection became a sought after thing amongst collectors. One of them happened to be the gold plated Dartz Prombron Aladeen armor protected SUV. Announcement of the Dartz Prombron Aladeen, a gold-coated version of the real armored SUV from the Latvian customizer whose tastes know few bounds – much like its new signature client, Sacha Baron Cohen’s Admiral General Aladeen from the movie “The Dictator.” Here’s how much it will cost to drive like the ruler of all Wadiya. Dartz touts their armored SUVs as the world’s most expensive, and with prices north of $1 million for the Monaco Red Edition, no one disputes that. Built in Latvia with custom armor, blast-proof windows and V8 engines of up to 400 hp, Dartz claims its vehicles can withstand hits from rocket-propelled grenades while swaddling passengers in luxury, although no one has recorded the outcome of such a test to date. Dartz’s largest claim to fame so far involved a custom Prombron interior featuring leather from whale penises – an option dropped after opposition and free publicity from Greenpeace and the World Wildlife Foundation. That was before its embrace as the ride of choice for “The Dictator,” whose release May 12 brought the Dartz style to an audience that may not realize it’s the most realistic part of the movie. Dartz’s newest customer announces the company will sell 10 copies of the Prombron tricked out as they appear on screen, at prices of $500,000 to $750,000 before any options for receiving love of a grateful public. Noticing the demand for the rather extravagant car, a limited edition run of the gold plated SUV has been released, which was unveiled at the Top Marques Show 2012, at Grimaldi, Monaco. Graced by the presence of His Serene Highness Prince Albert II, this event showed the unveiling of the vehicle along with official badge associated with it. Amongst its features were the B2 to B7+ protection, 3-inch thick anodized glass to resist most guns, exotic leather and wooden trimmings for the interiors, reclining massage seats, and champagne chillers just like it was in the movie. The special gold plating of the body also ensures the extra bling factor for this limited edition SUV, which incidentally would also make it the most expensive armored SUV in the world currently. Looks like the orders are already flowing in, and the rich folks in the Middle East might order a few of these extravagant SUVs.